It was 75 years ago today, on 18 April 1938, that Action Comics #1 (June 1938) hit news stands here in the United States. What made this comic book different from any other comic book then on news stands, drug stores, and elsewhere is that it marked the first appearance of Superman. Although he is commonly referred to as such, Superman was not the first superhero (he is pre-dated by Zorro, The Shadow, Doc Savage, and others), and the character did owe a good deal to both Philip Wylie's novel Gladiator and the popular pulp magazine hero Doc Savage. Regardless, there was a good deal about the character that was starkly original. Indeed, as a "strange visitor from another planet," it was technically Superman who was his real identity and not Clark Kent--the exact opposite of superheroes before him, from Zorro to The Green Hornet. Today, after several motion pictures, two live action television series, numerous animated series, and literally thousands of issues of comic books, it is easy to take the Man of Steel for granted. After all, for most of us living today he has always been a part of the pop culture landscape. It is hard for us today to grasp the impact that Superman had upon his initial appearance. Indeed, it would be insufficient to say that Superman was the "Teenage Mutant Ninja Turtles" or "Power Rangers" of the late Thirties and early Forties. He was much bigger than that and it was only within a few years of his first appearance that he had conquered media beyond the pages of comic books. The sales of Action Comics #1 were a clear sign of just how popular Superman would become. The print run of Action Comics #1 was 200,000 copies, which was rather large for a comic book in the late Thirties. It sold out almost immediately. Action Comics was an anthology title, featuring other characters besides Superman, including Zatara (a magician character) and Tex Thompson (an adventurer) among others. As the months rolled by Action Comics would rise to a circulation of 1,000,000 copies. Despite this it would take National Allied Publications (one of the companies that would become DC Comics) some time to realise that it was Superman who was fuelling sales of the title. 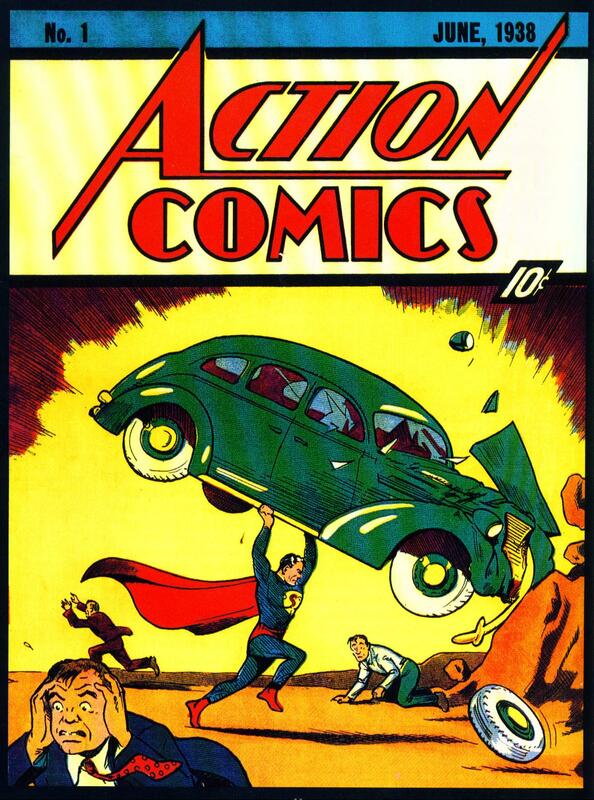 He would not appear again on the cover of Action Comics until #7 (December 1938). It would not be until Action Comics #19 (December 1939) that Superman started appearing on each and every cover of the magazine. While it took some time for National Allied Publications to realise the popularity of Superman, they swiftly acted to capitalise upon it once they did. Only a little after his first appearance in Action Comics #1, Superman appeared in his own self titled magazine. Superman #1 (summer 1940) was the first comic book ever dedicated to a single superhero. The interrelated companies that would become DC Comics would follow Superman up with more superheroes. The Crimson Avenger made his first appearance in Detective Comics #20 (October, 1938). This now forgotten character would be followed by an even more successful superhero--Batman first appeared in Detective Comics #27 (May 1939). Other companies would soon introduce their own superheroes. Fox Publications introduced Wonder Man in Wonder Comics #1 (May 1939), only to have him sued out of existence as being a plagiarism of Superman. Quality Comics introduced Doll Man in Feature Comics #27 (December 1939). The company that would become Marvel Comics would introduce The Human Torch in Marvel Comics #1 (Oct. 1939). All-American Comics Inc. (one of the companies that would become DC Comics) would introduce no less than two iconic superheroes in Flash Comics #1 (January 1940)--The Flash and Hawkman. Even as other superheroes were making their first appearance, however, Superman was already expanding into other media. In fact, it was only a mere nine months after his first appearance in Action Comics #1 that Superman appeared outside of comic books. It was on 16 January 1939 that the McClure Syndicate began distributing a Superman daily comic strip to newspapers. On 5 November 1939 a Superman Sunday strip was added. At the height of its success the Superman daily strip appeared in 300 newspapers and had a readership of over 20 million. In all it would last 27 years, ending in May 1966. The "Superman" newspaper strip would have a lasting influence on the Superman mythos. In his initial appearances in the comic books, Superman's archenemy Lex Luthor had red hair. It was the newspaper comic strip that established him as being bald. Mr. Mxyzptlk, the imp who would plague Superman throughout the years, would also make his first appearance in the newspaper strip. The newspaper strip would also be the first medium to feature Clark Kent changing into Superman in a phone booth. Superman was less than two years old when he conquered yet another medium. It was in 1939 that Allen Ducovny, National Allied Publications' press agent, and Robert Maxwell, the man responsible for supervising the licensing of Superman toys and other products, prepared four different audition discs for a Superman radio show. Eventually The Adventures of Superman was bought by Hecker's H-O Oats and made its debut on 12 February 1940. The radio show would have a lasting impact on the character of Superman. The characters of both Perry White and Jimmy Olson originated on the radio show. What is more, it was Messrs. Ducovny and Maxwell who wrote the famous opening for the radio show, forever associated with the Man of Steel ever since: "Faster than an airplane, more powerful than a locomotive, impervious to bullets. 'Up in the sky - look!' 'It's a giant bird.' 'It's a plane.' 'It's Superman!'" It was also on The Adventures of Superman that Kryptonite first appeared and on the radio show that Superman first teamed up with Batman and Robin. The Adventures of Superman proved to be very popular. Beginning as a syndicated show, it moved to the Mutual Broadcasting System on 31 August 1942 and then ABC on 29 October 1949. The radio show would run until 1 March 1951 for a total of a little over eleven years. By 1940 Superman was regularly appearing in three different media: comic books, a newspaper strip, and radio. It would be in 1941 that Superman would conquer the silver screen. With such success it was natural that Paramount Pictures would take an interest in the Man of Steel. The studio approached animators Max and Dave Fleischer, whose animated shorts they distributed, with the offer of producing a series of Superman cartoons. The Fleischer brothers were not particularly interested in making Superman cartoons, and because of this they quoted a then astronomical budget of $100,000 for the series. To their shock and perhaps to their dismay as well, Paramount accepted the offer. The first Superman animated short, entitled "Superman," but also known as "The Mad Scientist," debuted on 26 September 1941, making Superman the first comic book superhero to appear on the big screen. Budgeted at $50,000 (a then unheard of amount for an animated short subject), "Superman" proved to be a hit at theatres. It also received its share of acclaim, even being nominated for Best Animated Short Film at the 14th Academy Awards (Walt Disney's "Lend a Paw" won). "Superman (AKA "Mad Scientist")" would be followed by 16 more "Superman" animated shorts. Paramount ended the series in 1943. While very successful, the "Superman" cartoons were very expensive, costing on average $30,000. Curiously, despite the fact that in the late Thirties and early Forties Superman was an outright phenomenon, it would not be until 1948 that he would appear in a live action film. It was not long after Superman's debut in 1938 that Republic Pictures, an independent studio best known for their serials, optioned the rights for a Superman serial. Unfortunately, National Allied Publications Inc. desired much more control over the production than Republic was willing to grant them. In the end Republic utilised the script to their proposed Superman serial for the serial Mysterious Dr. Satan (1940), changing the names and other particulars. The serial featured a masked hero, Copperhead (Robert Wilcox) who faces off against a would be world conqueror, Dr. Satan (Eduardo Ciannelli). Republic Pictures would make a second attempt at a "Superman" serial in 1941, even going so far as to announce the project in a promotional book for movie distributors, Republic Pictures Advance Serial Promotion Book. The promotional book even featured drawings of proposed scenes for the serial. Unfortunately for Republic Pictures, it would turn out that Paramount not only had the rights to produce the Superman cartoons, but they had exclusive rights to the Man of Steel on the silver screen. Unable to get the rights to Superman, Republic Pictures then bought the rights to bring Captain Marvel, published by Fawcett Publications. National considered Captain Marvel to be a plagiarism of Superman and had sued Fawecett Publications. With Republic producing the serial The Adventures of Captain Marvel, they then also named Republic in the plagiarism suit. Ultimately it was only after the film rights to Superman became available after Paramount had ended its series that Superman would see his live action debut. B movie and serial producer Sam Katzman bought the rights to the character. Curiously, even though he had signed a contract with Columbia Pictures to produce low budget serials and feature films in 1945, he initially took his "Superman" project to Universal Pictures and Republic Pictures. Universal turned Katzman down, as they had ceased making serials in 1946. With the popularity of the serials in a serious decline, Universal had no desire to get back into the business. Republic also turned Katzman down, claiming that it would be impossible to bring a superhuman character who could fly, like Superman, to the big screen. Given that Republic Pictures had produced The Adventures of Captain Marvel and in a few years would produce another serial with a hero who could fly (King of the Rocket Men in 1949), this seems as if it was merely an excuse. It is quite possible that, since National Comics (the company that emerged after the merger of National Allied Publications, Detective Comics Inc. and All-American Comics in 1945) had included Republic in their copyright infringement lawsuit against Fawcett Publications the studio had no real love for the comic book company. It might also be pointed out that by 1946 the majority of Republic Pictures' serials were based on original material rather than pre-existing characters from other media. Sam Katzman finally took his "Superman" project to Columbia Pictures, who had already brought various National Comics characters to the screen. In fact they had brought National Comics characters to the big screen before. It was Columbia who first brought Batman to the movies in the 1943 serial The Batman. In 1946 they brought Hop Harrigan, a flying ace initially owned by All-American but by that year owned by National Comics, to the big screen. It was in 1947 that Columbia adapted The Vigilante, a cowboy themed superhero who shared the pages of Action Comics with Superman, into a serial. With Kirk Alyn in the lead role of Clark Kent/Superman, the serial Superman made its debut 5 January 1948. Of course, by that time Superman had already been preceded in live action films by a number of comic book superheroes, including Captain Marvel (the first comic book superhero to appear in a live action film), Batman, and Captain America. While it would be nearly ten years after his first appearance that Superman made his live action film debut, it would be in 1942 that a novel featuring the Man of Steel would be published. The Adventures of Superman was written by George Lowther (a script writer on The Adventures of Superman radio show). Like the radio show, the novel The Adventures of Superman would have some impact on the character's mythos. It would include the first detailed description of Superman's home world of Krypton. It would also establish the names of Superman's biological parents as "Jor-El" and "Lara (in the comic books they were originally called "Jor-L" and "Lora")." As swiftly and phenomenally popular as Superman became in the late Thirties, it was not long before Superman merchandise appeared. What may have been the first licensed Superman toy appeared in either 1939 or 1940. It was what today would be called an "action figure," a 13" wooden articulated figure of Superman manufactured by Ideal Toy Company. In 1940 Daisy, best known for their air rifles, manufactured a "Superman Krypto-Raygun Projector Pistol." That same year Monarch produced a Superman hair brush. In 1942 Syracuse Ornament manufactured a miniature Superman statue. Not every bit of Superman merchandise targeted children. There were more adult items ranging from cigarette lighters to hood ornaments. So popular was Superman that in mid-1939 National Allied Publications launched an official Superman fan club, the Supermen of America. The early membership kits included a membership certificate, a Superman pin back button, and a Secret Code decoder sheet. Over the years the Supermen of America would offer everything from patches to sweatshirts to rings. Membership in the Supermen of America was very economical for the era, costing only 10¢. The club would also prove popular. It lasted from 1939 to the mid-Sixties. Beyond having his own fan club within a year of his first appearance, it is also a mark of Superman's early popularity that a day long event was held at the 1939-1940 New York World's Fair in his honour. At the World's Fair 3 July 1940 was declared "Superman Day at the World of Tomorrow." For the day admission to the Fair was dropped from a quarter to a dime. Charles Atlas judged a "Super Boy and Super Girl" contest. There were athletic competitions for boys and girls. The Adventures of Superman was broadcast live from the Assembly Hall of the World's Fair. As might be expected there was also a parade and an appearance by Superman himself as well. Superman at the World's Fair was played by character actor Ray Middleton, who would go onto appear in such films as Lady for a Night (1942) and 1776 (1972). He was the first man to ever portray the Man of Steel live. As if appearing at the World's Fair was not enough, Superman was also the first superhero to have his own balloon in the Macy's Thanksgiving Day Parade. The Superman balloon appeared when the character was a little over a year old, in 1939. It was the first of three balloons portraying the Man of Tomorrow in the parade. Sadly, it would not survive the advent of World War II saw the Macy's Thanksgiving Day Parde cancelled in 1942, 1943, and 1944. The balloons were donated to the government to help in the war effort (rubber was in high demand). Besides the Superman balloon, the Uncle Sam balloon was also sacrificed to help our armed forces. Of course, in the years following the Thirties and Forties Superman would see two live action TV shows (The Adventures of Superman and Lois & Clark: The New Adventures of Superman), several Saturday morning cartoons (the first, The New Adventures of Superman, debuting in 1966), six feature films (with a seventh, Man of Steel, coming out this summer), thousands of merchandise, and, as would be expected, thousands of comic books. Here it should be pointed out that Superman's numerous appearances in various media and the huge amount of merchandise over the years is probably not due simply to the character's longevity. In less than a year after his first appearance, Superman was already appearing in media other than comic books. Within two years of his first appearance he was already appearing in four different media (comic books, a newspaper strip, radio, and animated shorts) and there were hundreds of Superman merchandise on store shelves. I rather suspect that in the late Thirties and early Forties many thought Superman was a fad. Given that 75 years later Superman comic books are still being published and a major motion picture starring him comes out this summer, it is clear he was not a fad. What started 75 years ago today with Action Comics #1 (June 1939) grew into a phenomenon, and that phenomenon grew into an American institution.